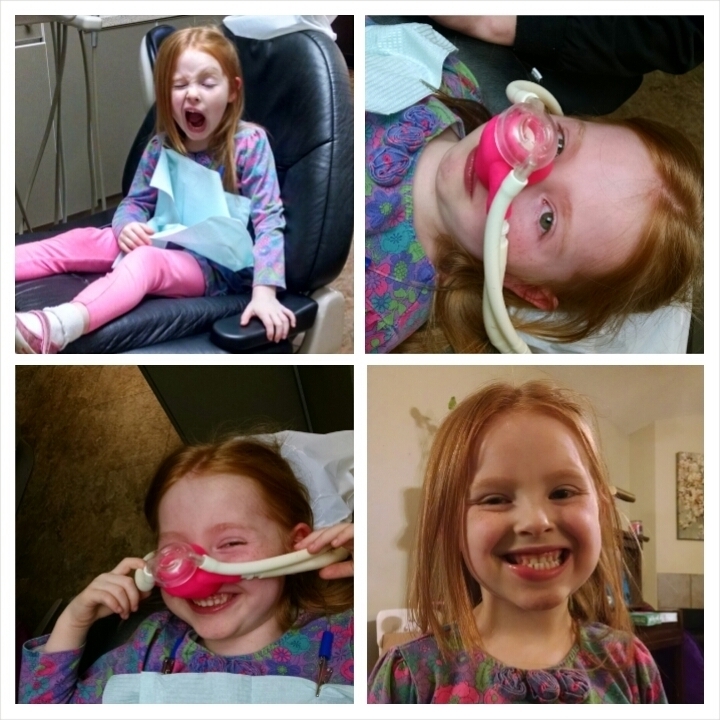 So Aylin got to experience the joy of getting her very first cavity fixed last Monday. I really hadn't expected to have to deal with that quite so soon... Clearly we need to work on getting those toofers cleaned better. Anywho... The dentist highly recommended we use the "happy gas" even though our insurance didn't cover it. So we went with it, and I'm glad we did. She was pretty nervous to start, and even cried just having to put on the "piggy nose" (happy gas) because "it was weird". But after having it on for about 60 seconds the happy kicked in, and she was quite the goofball. She cracked herself up several times, and told the dentist and his assistant that everyone that worked at the dentist office should wear shorts, swim suites, flip flops, and piggy noses for their daily uniform at work. He got quite the kick out of her. He also joked that he should start an anonymous twitter account for "things kids say while on nitrous", I'm sure it would be a hoot if Aylin was any indication. So here are our pictures from the event. Honestly the worst part was a combination of waiting for the numbness to wear off, and that half asleep tingling sensation while her mouth slowly came back to life. She fussed with and bit on her lip enough while it was numb that she'd made it raw and swollen. She reacted to it the same way I do; it lasted FOREVER. She had the work done at 4pm and the numbness still hadn't gone away by bedtime at 7:30. Thankfully she was worn out enough that even though she cried herself to sleep, it didn't take long for her to just give in and fall asleep.